1) What did Ray Liotta reportedly get done? 2) What did Kiefer Sutherland reportedly top up? 3) What did Leonardo reportedly buy? 4) What does Demi Moore reportedly eat to keep her youthful looks? 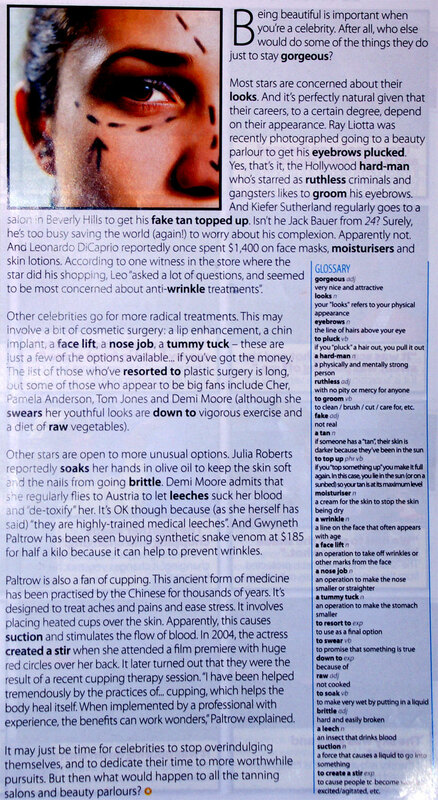 5) Why is Gwyneth Paltrow a fan of cupping? Look at this extract from the article "I have been helped tremendously by..."
The speaker has used a Present Perfect Passive construction ("has/have been" + a past participle). Transform the following sentences into the Present Perfect Passive. You don´t need to include the agent (the person who does the action). 1) They have written the report. 2) They have cut up the pieces of paper. 3) They have sent off then proposal. 4) They have filled the jug with water.